My niece would love doing this together. Commented earlier and forgot the "s" on the end of my email. Something I would love to try...always looking for new things to try! I would so love to win this and bring a different element of design into my jewelry. 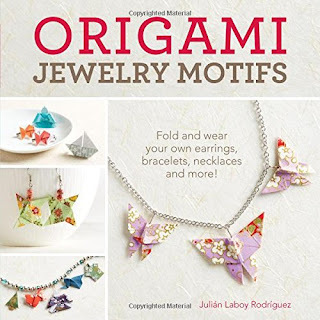 bonjour, je trouve les bijoux origami tres frais et printanier (et ici en France et en Europe, nous avons grand besoin de l'air du printemps en ce moment). votre giveaway est-il ouvert aussi au non resident des USA ? je tente ma chance. grace à votre blog et à d'autres, mon anglais lu s'ameliore mais c'est une traduction Google. hello, I find the origami jewelry very fresh and spring (and here in France and in Europe, we have great need of spring air at the moment). Your giveaway is it also open to non-resident of the USA? I try my luck. thanks to your blog and others, read my English is improving but it is a Google translation. I've made crane earrings before so I'd love to learn more patterns!